Packaging demand, inflationary pressures, the status of "Wallula No. 3," and inventory levels are all topics shareholders should be conversant with. Packaging Corp. reported diluted earnings per share (EPS) of $2.18 last week, exceeding management's guidance of $2.16. After adjusting both the current and prior-year quarters for costs to convert the No. 3 paper machine at the company's Wallula, Washington mill to linerboard, Packaging Corp. reported EPS of $2.23, which outpaced Q3 2017's $1.68 in earnings by an impressive 33%. Below, we'll walk through key highlights from the earnings report that shareholders should consider when evaluating Packaging Corp.'s current condition. Packaging segment revenue rose 14% year over year, to $1.5 billion, driving total revenue up 10.4%, to $1.8 billion, and compensating for a slight decline in the paper segment, which dipped 6.3%, to $254.3 million. As I discussed earlier this year, Packaging Corp. has fine-tuned its manufacturing operations over the last several quarters to take advantage of surging demand for cardboard packaging versus paper. The most visible aspect of this shift is the conversion of Wallula No. 3 from paper to packaging. During the last three months, the company hit record third-quarter corrugated shipments and achieved an all-time record for containerboard shipments. Management is utilizing high demand to adjust pricing, which helps mitigate inflationary effects (which we'll address below). In the third quarter, price and mix improvement in the packaging segment contributed $0.38 of positive impact on EPS. In a pattern similar to the last sequential quarter (Q2 2018), inflationary cost increases pressured the business. Packaging Corp. absorbed a $0.28 headwind in the form of operating cost increases over the last three months. Rising wages formed a prominent drag on costs in the third quarter, and management has signaled continuing wage inflation into the fourth quarter of 2018. In addition, fuel expense impeded results, producing a drag of $0.08 on EPS (exclusive of the $0.28 in general operating costs above). Fuel costs are expected to rise again in the fourth quarter against the prior year, as management believes already elevated fuel prices will climb incrementally due to seasonally cold weather. So far, the conversion of the Wallula No. 3 machine can be labeled a clear success. During the company's third-quarter earnings conference call, CEO Mark Kowlzan reminded investors that "when we started up [the machine] in the first week of June, within the first two hours, we were selling premium high performance virgin kraft linerboard." The No. 3 machine is currently out of service in a planned outage for the final implementation of conversion after which it will be able to run "all out." By the beginning of November, the machine will be operating at its full capacity of 1,150 tons per day versus the 700 to 800 tons of daily output it recorded in the initial conversion phase. In both the company's press release and its earnings conference call, Packaging Corp.'s management relayed to investors that inventory levels expanded significantly in the third quarter versus the prior-year quarter. Containerboard inventory jumped by 50,000 tons against the second quarter of 2018 and by 84,000 tons year over year. For perspective, 84,000 tons of inventory equals roughly seven weeks of production. Management distilled three reasons for the inventory buildup. The first is to compensate for the current outage at Wallula No. 3, which will end in the first week of November. Second, quarter-end inventory levels were comparatively higher in Q3 2018, due to the company's acquisition of Sacramento Container Corporation in early October 2017. Those inventory level differences will be "lapped" after the fourth quarter of 2018. Finally, management is purposely bulking up inventory levels at various plants to try to keep containerboard available in strategic geographic locations across the U.S. to neutralize at least some of the current high cost of freight shipping. Conversely, though it comprises a much smaller portion of the balance sheet, paper inventory has decreased roughly 39% year over year, primarily due to the conversion of Wallula No. 3 from paper to linerboard. Rising demand means that paper inventory may remain tight for the next few quarters. Even though paper volume fell in the third quarter, the company achieved positive pricing and mix in the paper segment, which provided a $0.13 beneficial impact to adjusted EPS. For the final quarter of 2018, management expects high production levels to positively affect results, although the impact will be somewhat constrained by the cost headwinds discussed above. If you look at share-price movement, investors seem to be encouraged by the company's relative outperformance over the last three months and are reasonably optimistic regarding the upcoming period. In my third-quarter earnings preview, I stated that Packaging Corp. would need a significant push beyond management's EPS guidance to jolt the "PKG" symbol out of its malaise. Shares indeed have received a jolt in a positive direction. Perhaps the company can build on the trend when it next reports in January. Packaging Corp. of America Earnings: Is a Third-Quarter Rebound in Store? 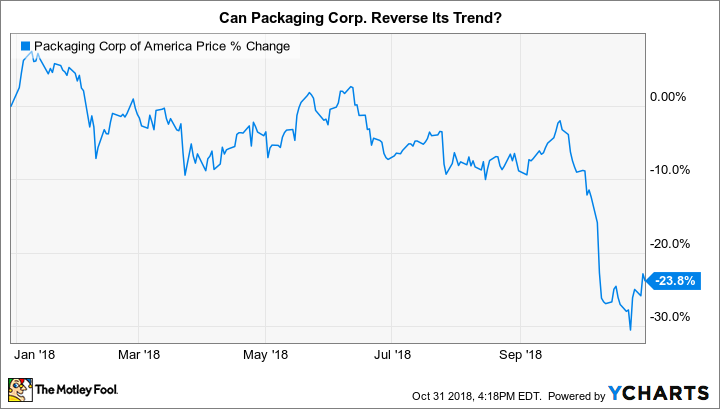 Can Packaging Corp of America Continue to Outperform in 2018?